You are currently viewing archive for September 2007. * - if necessary. Times are yet to be announced. Bryan Hoch reports that Matsui will be getting fluid off his right knee drained. He isn't expected to miss any of the ALDS, but he will miss today's season finale. Pettitte got pounded in this one, allowing 8 earned runs (and 1 unearned run) on 8 hits and 3 walks in 5 innings. And, yet, he picked up victory number 15. Shelley Duncan singles, moving Posada to 3rd. Bronson Sardinha singles, scoring Posada and moving Duncan to 2nd. Alberto Gonzalez reaches on an error by the shortstop, scoring Duncan and moving Sardinha to 3rd. Gonzalez advances to 2nd. Melky Cabrera doubles, scoring Sardinha and Gonzalez. Betemit advances to 2nd on a passed ball. Jason Giambi doubles, scoring Betemit and moving Abreu to 3rd. Robinson Cano singles, scoring Abreu and Giambi. Posada (the 10th hitter) strikes out for the first out. Shelley Duncan homers, scoring Cano. Gonzalez grounds into a double play ball for outs two and three. Besides that inning, the only other Yankees run was scored on a Posada RBI single (scoring Cano) in the 2nd. The other 7 innings were zeros. The Orioles scored 2 in the 1st, 2 in the 2nd, 2 in the 3rd, 3 in the 5th and 1 in the 8th. The 1 run came off of Ron Villone, who pitched 2 innings of relief. Edwar picked up a scoreless inning as did Veras, who picked up his 2nd save of the season. It's been a long season, folks. The regular season comes to an end tomorrow. Your starting pitcher? The one - the only - Kei Igawa! He'll face Brian Burres. If the Yankees could find it in their heart to start Posada, A-Rod, Jeter and Matsui, my fantasy team would certainly appreciate it. After last night's loss and the Red Sox victory, everything is set in stone. The Red Sox have won the American League East and the Yankees will face the Cleveland Indians in the ALDS. Congratulations to the Red Sox and their fans. Mariano Rivera didn't have it on Friday night in Baltimore. He entered in the bottom of the ninth with a 9-6 lead. He loaded the bases and got two outs, but Jay Payton hit a three run game tying triple which resulted in the Orioles tying the game. In the 10th, the Yankees got a leadoff double from Jeter and he got to third with one out. A-Rod and Matsui were walked intentionally to load the bases. Molina and Giambi were retired without the Yankees scoring and the game went to the bottom of the tenth. The Orioles got a one out double and the runner got to third. The Yankees returned the favor in loading the bases. Edwar Ramirez struck out Kevin Millar for the second out, but Melvin Mora laid down a perfect bunt to score the winning run. Earlier in the game, the Yankees benefited from a four RBI night from A-Rod. He hit a two run homer, a run scoring double and a run scoring single. Mike Mussina started for the Yankees and was ineffective. He gave up six runs in five innings and left leading 7-6. The Yankees would add two more runs with a Damon homer and an RBI single from A-Rod. 22 of the 25 spots were unanimous. The other 3 made the roster based on receiving votes from 3 out of 4 of us - they were Alberto Gonzalez, Jason Giambi and Chris Britton. There were 2 players who received votes who did not make the roster - Edwar Ramirez (2 votes) and Jose Veras. There are a lot of folks out there who are quick to assume that the Yankees would be better off with the wild card considering their 6-0 record against the Indians and their 3-6 record against the Angels. But remember...in 1997 the Yankees were in a similar situation, only this time futilely trying to stage a comeback against the divison leading Orioles. The Yanks were "better off" because they had a winning record against Cleveland and were 4-7 against the Mariners (according to baseball-reference.com), who would have been their opponent had they won the division. Sure enough the Yankees lost the ALDS in 5 games to the Indians, while the Orioles manhandled Seattle in three games. Move over Frank Sinatra. The Board of Directors of Yankee Global Enterprises LLC announced today that Harold Z. (Hal) Steinbrenner has been elected as Chairman of the Board. This used to be Steve Swindal's spot and he was the heir-apparent (before the divorce) so it looks like Hal is the go-to guy now. Mark Feinsand and Peter Abraham have good write ups on the celebration that followed the Yanks clinching a playoff spot. Worth a read. Game 159 looked to be a fairly uninteresting game going in. The house money/rest everyone line-up was in as six of the regulars got a rest. Derek Jeter, Alex Rodriguez, Bobby Abreu, Jorge Posada, Doug Mientkiewicz and Melky Cabrera were not in the line-up. Still, there was two big reasons to watch this game and they were both under the age of 24. Scott Kazmir was and starting and in need of 6 strikeouts to pass Johan Santana as the K leader for the majors. Phil Hughes was looking for a solid start against a good hitting team (Tampa Bay was 5th in the AL in scoring after the ASB - .276/.346/.443/.788 line for the team) to solidify his role on the postseason roster. For the first 6 innings, the story was definitely the pitching. Hughes and Kazmir matched zeroes until the bottom of the fourth when Carlos Pena took Hughes deep for his 44th homerun and 119th RBI of the season. Anyone who expected that from Pena, raise your hands. Now hit yourself with that hand because you're lying. Bronson Sardinha did get his first hit in the Majors in the third but it wasn't until the sixth that the Yankees even made Kazmir really work. Alberto Gonzalez hit a one-out single and was brought home on a Johnny Damon RBI double. Kazmir got out of the inning but that was it for him, 6 IP, 3 hits, 1 ER and 10 Ks. Wow - I'm sure that somewhere, there were some Mets fans watching that performance (against a very good hitting AL team) and wondering whatever happened to Victor Zambrano. In the very next inning, the Yankees broke the tie against the (much maligned) Tampa Bay bullpen. With one out, Shelly Duncan singled and Robbie Cano doubled him over to third. It was Cano's 40th double of the year and he's now hit that mark two straight years. With Jose Molina up and one out, the Rays brought the infield in and it immediately burned them and Jose punched a soft single right past the drawn-in field for 2 RBIs. 3-1 Yankees. Phil pitched through the 7th and was effective, giving up 4 hits and 2 walks (5 Ks) on 102 pitches. Joba Chamberlain came in (yes, he was used on back-to-back days) and was his usual effective self over on inning, giving up one hit but striking out 2 on 20 pitches. Righty Jose Veras came in for the ninth and nailed the door shut for his second career save (he's 2-2 now). Yankees win. Whether or not the Yankees catch the Red Sox for the American League East title, wild card or division winner, this season has got to be the most wild and riveting regular season for the Yankees that I might ever get to watch (sorry old timers, but I was born in 1985 so I missed the '78 campaign). The Yankees last night completed what's hopefully just the first chapter of their amazing comeback story as they clinched their 13th straight postseason berth after trailing in the wild card by 9 games on July 1 with a convincing 12-4 victory over Tampa Bay. After the bullpen blew a 5-run lead the previous night, the offense made sure to give themselves a big enough cushion that only Tampa Bay's bullpen is capable of ruining (i.e. Sept. 11 and Sept. 12 when they basically handed the Red Sox the division crown). Derek Jeter homered and was just a triple away from the cycle, Cano homered and drove in 5, and Doug Mientkiewicz continued his renaissance with a 4-5 night. Four Yankees finished the game with 3 hits or more (Jeter, Posada, Damon and Mientkiewicz). Chien-Ming Wang was solid in his final regular season start, allowing two runs and striking out 6 in six innings of work as he picked up his 19th win (2nd straight season). The bullpen pretty much held it down this time, aside from a two-run 8th for the Devil Rays courtesy of Luis Vizcaino. Joba and Mo each pitched scoreless innings. Well, there are still four games left to play, and who's to say that the Yankees can't sweep the remaining four in Tampa Bay and Baltimore and the Red Sox can't lose three out of 4 to Minnesota? It's not likely but hey, there's definitely reason to watch. The Yankees will continue their quest to make their season even more magical tonight as Phil Hughes will go up against Scott Kazmir in a battle of young arms. Game starts at 7:10 E.T. The night out cost Giambi roughly $5,000 and was appreciated by the guests. There are quotes from Giambi, Clippard and Kennedy in the article. In 10 innings, the Devil Rays had 5 hits. We had 12. So, how'd we lose? 11 walks, that's how. They had 11 walks. While we had a healthy 6, that's not 11. They left 20 runners on base, even - while we left 16 on. But, with that said, the walks that killed us were the ones in the Devil Rays' half of the 6th inning. Would it surprise you if I said that Kei Igawa had 0 ER in 5 innings? Well, he did. He issued 5 of those 11 walks, but only 2 hits and no one ever came around to score on him. It's just the Devil Rays, but it's always good to see someone have a decent performance. No, the problems came after he exited the game, at the hands of Edwar Ramirez and Brian Bruney. Edwar entered and walked B.J. Upton. He retired Delmon Young, but then allowed Dioner Navarro to double, scoring Upton. Alright, that's OK, we have a 5-1 lead. Just let people hit the ball. The best hitters get out about 70% of the time. Argh, another walk, to Jonny Gomes. 1st and 2nd, 1 out. That would be the end of Edwar's hand in this and Brian Bruney would then come in and inherit those runners. He just continued the walk parade, though, issuing one to Greg Norton to load the bases. And then, yes, another walk. This time, it's issued to Akinori Iwamura. That walks in a run. You walk enough guys and it's usually going to bite you. In just his 9th game this year, Jorge Velandia made us pay dearly by hitting a grand slam to seize the lead, 6-5. All 3 runners he drove in reached base on a walk. Before September 13, he had not appeared in the majors since September 28 of 2003. Ron Villone relieved Bruney and retired Carlos Pena to end the inning. So, you go from having 5-0 lead after 5 and 1/2 innings, to being down 6-5 with 3 to play. In those 3 innings, we were only able to sneak in 1 run - on a Melky sac fly that scored Bronson Sardinha in the 8th. Meanwhile, the combination of Villone, Britton, Farnsworth and Veras pitched a scoreless 3 and 1/3 innings. So, we're headed to extras for the 3rd time in 5 days. After Cano, Molina and Cabrera went down in order in the top of the 10th, Jeff Karstens came in the pitch the bottom. It was over fast. The first batter he faced, the former Yankee Navarro, took him deep for a walk off homer. Game over. A-Rod had a grand slam in the 3rd, scoring Damon, Jeter and Abreu. For the day, he had that and a walk. Damon was 5 for 5 with 2 R, Jeter was 2 for 5 with 1 2B, 1 R and 1 RBI, Abreu was 0 for 3 with 1 R and 2 BB, Matsui was 0 for 3 with 2 BB, Posada was 1 for 4, Cano was 3 for 5, Mientkiewicz was 0 for 2 with 1 BB and Melky was 0 for 4 with 1 RBI. Going back to Jeter, it was about 2 weeks ago when I was hearing some people suggest that Jeter needed to sit down because he was hurting the team, playing hurt. I just don't see how you bench Derek Jeter, "slump" or not. He's not the problem. Wasn't even that bad of a slump, really. Not like he was going 3-5 games without reaching base or something. Since September 15 (10 games), he's 19 for 47 (.404) with 8 runs, 5 doubles, 2 home runs, 6 RBIs, 1 walk and 1 stolen base. He's got a 12 game hitting streak. Yankees didn't win and the Tigers didn't lose, so our magic number for the Wild Card sits at 1. The Red Sox did win, however, and their magic number for the East is now 3. Oh well. Today at 7:10 PM ET, we'll have Wang (18-7, 3.72 ERA) against J.P. Howell (1-5, 6.80 ERA). So, you're telling me there's a chance! Figures. I start talking about pitching depth and Clemens is out for the regular season and Kennedy could be out for rest of this season. 09/25: Ian Kennedy Done for the Year? Ian Kennedy, who was scratched from his Saturday start with back spasms, is unlikely to pitch again during the regular season because of the injury. "It's nothing more than it was, but it's working its way out of his system," Torre said. "It's a little discomfort. I'm not sure he'd be able to throw enough to be in a situation where he could (pitch)." Ian Kennedy's impressive season may be over. Torre said the rookie righthander, who started 2007 in A ball, is still troubled by a back strain and may not pitch again in the regular season. That would probably nix him from a postseason roster spot. One pitcher who probably doesn't figure into the Yankees' plans for the remainder of the week and perhaps into the playoffs is Kennedy, who missed his last start with soreness in his upper back. Update: Removed Jose Veras from this list. Mike makes a good point that the skin color is off. So, it's most likely Watanabe as was reported. For the annual rookie hazing dress up, this year's theme was The Wizard of Oz. Here's the lineup (names linked to pictures). Jen from NoSenseWorrying.com has a great set of photos including a couple of classic shots of A-Rod and Mo and Mo and Jeter enjoying the moment. "This is a very glorious moment for me," Duncan said. "It is what it is. I was meant to be the Scarecrow. You go with it, you deal with it and you don't think about it, because what can I think with? I'm a Scarecrow with a mission." "Put 'em up, put 'em up," Chamberlain yelled, shadow-boxing anyone who walked near. Via Jim Johnson and Ben. With the Tigers loss yesterday (such a downer that we didn't win yesterday - yeah, I know it doesn't mean much, but to be one game back in the division with 6 to play? ), our magic number to clinch a playoff spot is now 1. A Tigers loss or a Yankees win today seals it. 22 year old Jesse Litsch goes today. This isn't a gimme by any stretch but I'd much rather face the kid with 3.86 ERA after the ASB than the guy with the 1.97 ERA. Clemens has been pushed back a day to Tuesday and Pettitte will start today, according to the official site. It'll be our final home game of the regular season and, if we can get a win, we'll be just 1 game back of the Red Sox. Crazy. The rules, as originally stated, said that Chamberlain could not pitch on back-to-back days. If he pitched two innings, he would need two days of rest before the extended outing and two days of rest after it. In addition, Chamberlain was not to enter a game in the middle of an inning, and once he began warming in the bullpen, manager Joe Torre would be forced to use him. Apparently, rules are made to be broken. Chamberlain entered Sunday's game in the eighth inning with two on and two outs, despite pitching two innings on Friday. It was the second time in five days that he had entered a game mid-inning. ... the Joba Rules have simply been altered to factor in pitch count. On Friday, Chamberlain threw two innings but needed a pedestrian 30 pitches to do it. That prompted Torre to speak with both Contreras and Cashman before Sunday's game and secure the OK to use Chamberlain, if needed. The Yankees struck first when, in the bottom of the second, Jorge singled in A-Rod to go up 1-0. Blue Jays starter Shaun Marcum would be removed after 3 innings after having some issues with his right knee. Our starter, Phil Hughes, went 5 innings, throwing 99 pitches and allowing 3 earned runs on 7 hits, 1 walk and 3 strikeouts. He gave up all 3 runs in one inning - the 4th - where he faced 7 batters allowing RBIs on a ground rule double and a single. The Yankees would come back and score 1 in the 5th (Matsui RBI triple, scoring Abreu) and 4 in the 6th (A-Rod RBI double, scoring Jeter and Minky and Matsui RBI single, scoring A-Rod and Abreu). The lead would go back and forth in this one, though. The Blue Jays grabbed it back in the 7th with a 5 spot. 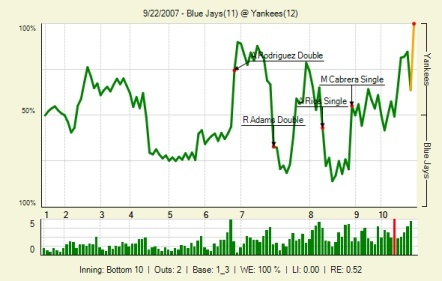 Then the Yankees pulled it back by scoring 3 runs in the bottom half. Melky had a 2 RBI single, scoring Cano and Sardinha and A-Rod then singled in Melky. The Blue Jays weren't done, though. They went ahead by 2 with 3 RBI singles in the top of the 8th, making the score 11-9. Neither were the Yankees. With 2 outs in the 8th, Melky singled in both Posada and Cano to tie it up at 11. Both teams went down in the 9th without scoring, leading us into extra innings for the second straight night. The Yankees got a scare in the top of the 10th when, with Jeff Karstens on the hill, Aaron Hill doubled with 2 outs and Matt Stairs went for home. He was gunned down and the Blue Jays rally was over. In the bottom of the 10th, Posada led off with a ground rule double. Damon pinch ran for Posada and the Blue Jays elected to give Giambi a free pass. Cano then flied to left to advance the runners to 2nd and 3rd. Wilson Betemit was due up and a sac fly would get us the win. But, he struck out for the 2nd out. And then, Melky Cabrera stepped to the plate and delivered a 2 out, walk off single to win the game. Huge night for the Melkster. He was 3 for 7 with 1 run and 5 RBIs, including 3 2 out RBIs - the final 3 RBIs of the game. In fact, the Yankees only had 3 RBIs that were not driven in with 2 outs. A-Rod had 3 2 out RBIs, as did Matsui. Speaking of Matsui, he's definitely out of his slump. He went 3 for 6 tonight with a triple and 3 RBIs. A-Rod was huge today, too, going 4 for 5 with 2 doubles, 2 runs, 3 RBIs and 1 walk. He now has 146 RBIs. Here's how the other offensive starters did: Jeter was 2 for 6 with 1 run, Abreu was 0 for 3 with 2 runs and 3 walks, Posada was 3 for 5 with 1 run, 1 RBI and 1 walk, Giambi was 0 for 5 with 1 walk, Cano was 0 for 3 with 2 runs and 2 walks and Minky was 2 for 2 with 1 run and 1 walk. Speaking of Mientkiewicz, he's hitting .450 since being taken off the DL. Whew. Karstens got the win - his first win in the Majors since September 19 - of last year. The Yankees have played almost 24 innings of baseball in the last 2 days. If there is anything good to mention, it's the fact that the Blue Jays are also getting worn out and we have 2 more games with them, rather than having to go and play a team that is a bit fresher. In all, 25 pitchers have appeared in these 2 games - with 7 pitchers throwing in both of them. The Blue Jays have ran out Roy Halladay, Scott Downs, Casey Janssen, Jeremy Accardo, Brian Wolfe, Joe Kennedy, Jason Frasor, Shaun Marcum, Brian Tallet, Brandon League and Josh Towers. That's 11 pitchers with Kennedy, Frasor and Downs pitching in both games. And for the Yankees, you have Chien Ming-Wang, Edwar Ramirez, Jose Veras, Ron Villone, Mariano Rivera, Joba Chamberlain, Luis Vizcaino, Brian Bruney, Phil Hughes, Ross Ohlendorf, Kyle Farnsworth, Chris Britton, Kei Igawa and Jeff Karstens. 14 in all. Villone, Veras, Ramirez and Rivera all pitched in both. It'd be nice to have a night game tomorrow after this one, right? Nope, day game! 1:05 PM ET. And we've got Moose going, so it's not too likely that the bullpen is going to get a lot of rest (even with his last couple starts in mind). Dustin McGowan (11-9, 3.84 ERA) will pitch for the Blue Jays. Not including today, here's Melky over the last 34 games: .213/.279/.252/.531. Over the last 15 games? Even worse - .150/.212/.183/.395 in 60 ABs. You gotta sit him down. All of Yankee-dom knows that when Melky is cold, he's ICE COLD. He's just not helping the team right now - play Damon in CF (.260/.311/.439/.750 over the same time period) and Matsui/Duncan in left and give Melky a couple extra days with Kevin Long. Update: Naturally, he makes me look silly by going 3 hits and 5 RBI in the 7th, 8th and 10th today. Still, he's been putrid outside of today so let's hope today is the start of one of his hot streaks because when he's going good, he's easily one of the most fun players on this team to watch. Now why weren't you accusing Torre of overusing his bullpen in 2003? Because he could start Clemens, Wells, Pettitte, Mussina, Weaver and Contreras. That's a little better than Matt DeSalvo, Chase Wright and Tyler Clippard. Torre didn't suddenly have a sudden philosophical change and decide to start going to his bullpen earlier. He's the same manager he's always been; it's his starting pitching that changes. Both teams were starting to run out of first run pitchers and it cost the Yankees in the 14th. Having already used Rivera, Chamberlain and Vizcaino, Torre turned to Brian Bruney in the 14th. He surrendered a go ahead homer to Gregg Zaun which eventually proved to be the difference. The game started out as it was billed with Roy Halladay and Chien-Ming Wang posting goose eggs through six innings. Wang gave up singles to Hill and Adams in the 7th. Zaun was robbed of a double by A-Rod but his sharp grounder down the third base line scored the first run of the game. Adam Lind followed with a single to right which Abreu fielded cleanly and made a perfect throw to the plate but Posada couldn't hold it and the Blue Jays had a 2-0 lead. Edwar Ramirez put kerosene on the fire as he gave up a two run homer to Alex Rios to extend the lead to 4-0. Halladay was dealing all night until the ninth when the Bombers erupted. Johnny Damon led off and bounced a double down the third base line. Jeter grounded out sharply to short. Abreu blooped a single to center as Damon took third on the play. A-Rod lined a sharp single up the middle for the first run. Matsui tried to pull an outside pitch and grounded to the right side for the second out with the runners moving to second and third. Posada followed with a grounder up the middle which Hill fielded but bounced his throw to first. Overbay bobbled the throw and Posada just crossed the bag before he gained control of the ball. The second run scored to make it 4-2. Cano grounded a ball in the hole between first and second which Hill probably should have fielded but the ball skipped under his glove and the score was now 4-3. Giambi pinch hit for Mientkiewicz and got a single to left center to tie the game. The Yankees could not add any more runs and the game stayed deadlocked at four until Zaun's homer won it in the 14th for Toronto. The series resumes this afternoon as the Pinstripers try to reduce their magic number of five to clinch the AL Wild Card. Sir Ian was going to pitch on Saturday, but he strained a muscle in his back. As Clemens was slotted for Sunday, he just moved up a day. Now, that's not happening, either. Roger Clemens' time as New York's probable starter for Saturday's matinee against Toronto lasted but a few hours, as the 45-year-old right-hander tweaked his left hamstring during cardio workouts and will also be scratched. Doesn't seem to be anything serious, but they will hold him back and Phil will start today, instead. Mussina is set to go Sunday and then they are hoping that Clemens can come around and pitch Monday. Ed Price reports that Ian Kennedy has been scratched from his next start (Saturday), which means that everyone will move up a day. Clemens will now pitch tomorrow, followed by Hughes and Moose. Well, here we go. This is obviously an important series for the Yanks but who are we kidding, all three of the remaining ones are. Still, with all the euphoria of Boston's division lead collapsing (but not gone away completely. so the job's not done ), this would be the typical place for a Yankee let down. Let's be serious - it's not like this team hasn't clawed back earlier this year only to fade away when they should have been capitalizing on Red Sox losses. They made pushes in both June and in mid-August before losing some pretty putrid games. If you look at those match-ups and think to yourself, wow, Toronto has a pretty nice set of starters (not including 22 year old Jesse Litsch who has a line of 6-9 with a 4.16 ERA), you aren't kidding. Since the all-star break, they have been far and away the best staff (including bullpen) in the majors. Since the ASB, they have only gone 34-31 but take a look at the rest of the stats: 3.41 ERA with 6 CG, a .243 BAA and a K/BB ratio of 2.44:1 in 580.1 IP. That's impressive - even more so when you look at where the Yankees are (17th, 45-21, 4.52 ERA, 0 CG and a .276 BAA). I started to dig a little deeper into those pitching numbers and if you go back farther past the ASB, Toronto actually looks even better. Since May 10th (when they were swept out at home by Boston) and their team ERA stood at 4.96, they have been very good, especially for a team in the AL East. In the 118 games since then, Toronto has put up a 3.65 ERA as a team. For perspective, there are three pitchers on the entire Yankees roster with an ERA under that: Mo, Joba and IPK. The peripherals are good too. A BAA line of .244/.306/.375/.681 with a 2.41 K:BB ratio in over 1084 IP. So with that kind of staff, why has the team only gone 64-54 (.542) in that time period? Well, their hitting is not nearly as good as the pitching. Over the same 118 games, Toronto has managed to put up a line of .257/.325/.415/.740 (generally equivalent to what Jose Molina has put up for the Yankees). If you look at their roster, you have three guys with OPS+ of 100 or over, Troy Glaus, Alexis Rios, Frank Thomas and Matt Stairs. With Glaus (and Wells and for all intents and purposes Overbay) now out for the year, Toronto's line-up is fairly weak and can certainly be pitched to. If the Yankees pitchers are on their game, they should be able to hold the Jays' offense to a few runs each game and then, it'll be up to the Yankees hitters to do their jobs. Helping the cause is that 3 out of the 4 Jays' starters pitch worse on the road than at home. Halladay (3.12 ERA at home vs a 4.59 ERA on the road), Dustin McGowan (3.18 vs.4.50) and A.J. Burnett (2.62 vs. 4.24) loved their Canadian digs while Shawn Marcum was the only exception (5.66 vs. 2.71). So there's what the Yankees are up against. It's a formidable pitching staff with weak hitters..against a formidable hitting team and two rookie starters. It should be an interesting series - let's go Yankees (and Scott Kazmir)! Jason Giambi received some better news regarding his aching right foot on Wednesday. The results of his midafternoon MRI came back negative, revealing just a bone bruise. X-rays taken on Monday revealed a contusion, but the swelling two days later raised the question of whether it may be something more. Results of the MRI performed at the Columbia Presbyterian Medical Center officially leave his status as day-to-day. It was a little bit gut-wrenching towards the end, but the Yankees won a nail biter by the score of 2-1 and moved to within a game and a half (1 in the loss column) to the Red Sox, who were swept in Toronto. Detroit also lost, giving the Yankees a 5.5 game lead in the wild card race. The Yankees jumped ahead 1-0 in the 2nd with a solo shot to right field by Hideki Matsui, and went ahead 2-0 in the 5th after Doug Mientkiewicz scored on a wild pitch by Brian Burress. Mariano Rivera labored in the ninth, as he entered the game with a 2-1 lead and took 34 pitches before finally striking out Scott Moore with the bases loaded to record his 30th save in 33 chances. Andy Pettitte improved his record to 14-8 with a stellar performance, allowing a hit per inning but still only allowing 1 run to cross the plate in 7 and 2/3, and as James mentioned, became the first Yankee draftee to win 200 games (163 with the Yankees, 37 with the Astros). So now a 10th straight A.L. East crown becomes so much more realistic. Most were saying that the Yankees would have had to sweep this past weekend to have any chance, but that was obviously contingent upon the assumption that the Sox would not be swept in Toronto and the Yankees would take all three at home against the Orioles. If the Red Sox go 4-5 the rest of the way, the Yankees could take it down with a 6-4 finish, or 7-3 if the Red Sox go 5-4. Heck, the Yankees now have a magic number of 11 to clinch the A.L. East (sure, you can have "magic numbers" when you're behind, why not? ), which is only two higher than Boston's number. The Yankees will get today off before beginning a three-game set against the Blue Jays tomorrow night at the Stadium. The pitching match up should be a great one, with Chien-Ming Wang facing Roy Halladay. With tonight's win (WOOT! ), Andrew Eugene Pettitte became only the 27th lefty in the history of baseball to notch his 200th career win. For anyone wondering, he's now tied with Chuck Finley (who ended up having a much better career than I remember) and George Uhle at 108th on the all time list. 207 wins would put him in the top 100 all-time. Andy's win also moves him into sole possession of 7th place on the all-time Yankees win list. His next win will tie him with Mel Stottlemyre for 6th all-time. Way to go Andy, it's a heck of an accomplishment and even with the talk of your retirement, I sure hope you decide to stick around for a year or two more. Update: Mike A. points out that Pettitte is the first pitcher ever drafted by the Yankees to win 200 games. Wow. That makes this even more impressive. I just wanted to mention that I'll be on The Sports Docket tomorrow (August 20) night. The show starts at 8:00 PM ET and I should be joining in at 8:30 for a few minutes or so. If you have the chance, check it out. According to sources, the Yankees had assumed that they would finish the season at home, and they had planned a host of festivities around the event. Yankee officials declined to comment on the schedule, citing the fact that the official schedule had not yet been released. Katy Feeney, MLB's senior vice president of scheduling and club relations, said that, to her knowledge, the Yankees had yet to file a complaint with the league. But one source said the Yankees are believed to be lobbying for a change in the schedule. The article notes that preliminary copies of the schedule have been sent to teams, allowing them an opportunity to request changes. It also includes quotes from Mo and Jeter saying it'd be nice to finish in Yankee Stadium. I think there is no doubt that a finish in the Bronx is the best way to go here. Yes, I know - most people don't exactly consider Steve Phillips a bastion of credible baseball info...but remember, he was the GM of the NY Mets for from July 16, 1997 until June 12, 2003 so there's gotta be something there, right? In any case, Deadspin's getting on him for the following comment at the end of August about the Yankees and their playoff chances. SportsNation Steve Phillips: The Yanks looked good beating an undermanned Tigers team, I agree with you. But I think the Mariners will hold on and win the Wild Card. Their starting pitching is just good enough and their bullpen in unreal. They have one of the best defenses in babseball, and they are starting to produce on offense. I think it is too little too late for the Yankees to make the playoffs." Well, looking back at the standings on that day, the Yankees were 1.5 games back of the Mariners (3 games on the loss side) with a +156 run differential (Seattle had a +21 RD). Yeah...probably not the best time to call the Yankees season over...though he certainly wasn't the only one. I don't know how reliable this report is, but it says that Jorge's dad says that he's looking for a 3 year extension worth $36 million. 09/19: Gagne: I Didn't Hit Mo, But Maybe Devern Hansack Did! Peter Abraham reports that, according to a report from Gordon Edes of the Boston Globe, Gagne denied throwing at Mo. He also had a suggestion as to who it might be. However, Gagne did reveal that there was a wild pitch and that it came from Devern Hansack, who was warming up at the same time he was. The Yankees are sending 4 guys to the Hawaii Winter Baseball League and each one of them is an interesting prospect. The 4 guys are the just drafted Brad Suttle, Austin Jackson, George Kontos and Mark Melancon (coming off TJ surgery). All four will be playing for the Honolulu Sharks, whose season begins September 29 and runs for 40 games until November 19. Hat tip to the always awesome Chad Jennings (he's the Times-Tribune beat writer and covers the SWB Yankees). If you're not reading/subscribed to his blog - you're missing out. Moose was on tonight against the only other team he's ever played for, throwing 7 innings of 0 run, 3 hit ball. It's win number 10 this season for Mussina, marking his 16th consecutive season with a win total in the double digits. The Yankees offense made sure he had plenty to work with, putting up a 6 run 4th and a 5 run 7th (and a 1 run 6th) to win, 12-0. Cano was 2 for 4 with a double, 2 runs and 2 runs batted in. Jeter was 3 for 4 with a double, 2 runs and a walk. Matsui may be breaking out of that slump - after going 1 for 5 with a homer yesterday, he was 2 for 5 today with a double, 2 runs and 3 runs batted in. Doug Mientkiewicz was 2 for 4 with a homer and 4 runs batted in. Besides that, Damon was 0 for 4, Abreu was 1 for 4 with 2 runs and a walk, A-Rod was 0 for 4, Posada was 0 for 1 with 3 walks and 3 runs and Melky was 1 for 4 with 3 runs batted in. Jose Veras and Ron Villone pitched a scoreless and hitless 8th and 9th, respectively. But, the night got better. Eric Gagne allowed 3 ER in the 8th inning to hand the Sox a 4-3 loss in Toronto. We're now two and a half games back. And the Indians homered Verlander (who I benched in the Yankees Bloggers League, believing/hoping that just such a thing would happen), to hand the Tigers a loss which, in turn, hands us a 4.5 game lead in the wild card. Couldn't have gone any better. Tomorrow, we'll have Pettitte (13-8, 3.89 ERA) against Brian Burres (6-5, 5.47 ERA) at 7:05 PM ET. A-Rod is up for his 4th Hank Aaron Award. Vote here. Update: Gagne says he didn't do it. Mariano Rivera's save against the Red Sox on Sunday night was harrowing enough in its own right. Little did the Yankees know that their closer was bothered by a finger injury throughout it all. Rivera was clipped by a stray baseball from the Red Sox bullpen on Sunday, startling him while he was stretching during the eighth inning. The ball struck his interlocked hands and robbed him of all sensation in his right pinkie finger just prior to his entrance into a two-run game. "That thing was numb," Rivera said. "I didn't have feeling for the whole game." Now, thankfully, Mo appears to be fine. Who threw the baseball, you ask? Peter Abraham says it was Eric Gagne. After hearing this, my research led me to this photo of what appears to be Gagne practicing for the opportunity. (Seriously, though, someone needs to raise the wall or throw in another direction. I would have thrown my body in front of that ball, had I been standing in the Yankees bullpen). The Yankees last night avoided their usual "Red Sox hangover" as they moved to within 3.5 games of the A.L. East lead with an 8-5 victory over the Orioles. The 3.5 game defecit is the closest the Yankees have been since April 21. The Tigers also lost a thriller in Cleveland, thanks to Casey Blake, giving the Yanks a 3.5 game lead in the wild card race. The Yankees' magic number to clinch the wild card is now 9. Last night showed some good signs for the Yankees offensively. Lately the lineup as a whole had not been hitting and they've had a tough time scoring for usually 7 or 8 innings out of a game and if they do score they were usually putting up a 5 or 6 spot in an inning and hoping that'd be enough. Last night they scored in every inning except the 1st and 6th, while every Yankee starter had a hit in the game except for Giambi. Matsui broke out of a slump with a tiebreaking solo shot and Jeter, Posada, Abreu and Doug Mientkiewicz all had multi-hit games. Phil Hughes had a rough first inning, allowing two runs before recording an out, but eventually settled down and had a pretty good outing. He finished with a line of two runs on six hits with 3 K's in 5 and 2/3 innings. Edwar Ramirez got some work in, allowing a run on 3 hits in one inning, and Luis Vizcaino turned in an impressive 1 and 1/3 inning of scoreless ball. The 9th inning was a little scary, as Kyle Farnsworth couldn't seem to get anybody out. Farnsworth allowed a run and left the game with two runners on, inducing a save situation in an inning where he entered with a 5-run lead. Torre yanked Farnsworth for Mariano Rivera, who struck out Melvin Mora to end the game after allowing an RBI single to Aubrey Huff. The series will resume tonight at 7:05 ET as Mike Mussina will face Jon Leicester. Mussina is coming off a solid start in his return to the Yankees' rotation. Leicester will be making just his third start of the season, carrying a record of 2-1 (he also has 5 relief appearances) and an ERA of 6.32. The second round of playoffs in the Yankees Bloggers Fantasy Baseball League has come to a close. It's crazy how close this match was down to the very end. I didn't get any offensive explosion as Posada, Jeter, A-Rod and Matsui combined to go 2 for 12 with 1 R, 1 HR and 3 RBI (all of the good stats coming from Jeter). But, it was just enough. Up until the top of the 8th inning in the Yankees game, with 2 outs, Mike was leading this game by the score of 5-4-1. He had stolen bases, ERA and WHIP in the bag. He held onto a small lead in batting average and was leading RBI by 3. We were tied in runs. But, then, that wonderful, wonderful man, Derek Jeter, came up to the plate. I love that guy. *tear* Just when you think he can't do anything else. He adds another chapter by winning the game for me in one swing of the bat. That one swing gave me 1 run and 3 RBI, precisely what I needed to win, by giving me the lead in runs and taking away the RBI category by tying it, allowing me to pull ahead 5-4-1. Talk about late dramatics. Crazy. This was definitely a close one. I won runs by 1, home runs by 5, wins by 2, saves by 3 and strikeouts by 5. Mike won stolen bases by 10, batting average by 1, ERA by 1.56 and WHIP by 0.19. We tied in RBIs at 32. Mike's pitching staff maintained a super low 1.30 ERA with a 1.05 WHIP. For the week, Prince Fielder was my offensive leader, hitting .381 with 3 homers, 3 runs and 6 runs batted in. Mike was lead by Jose Reyes (5 R, 1 RBI, 4 SB, .375 AVG) and Grady Sizemore (7 R, 2 RBI, 2 SB, .286 AVG). Pitching wise, Scott Kazmir was a giant this week, picking up 2 victories and 21 strikeouts with a 0.00 ERA and 1.14 WHIP. I also had wins from Joe Borowski, Jair Jurrjens, Justin Verlander and Joe Saunders. Huston Street had a 4 save week while Mariano picked up 3. Fausto Carmona had a huge week for Mike, as well, with 2 wins, 12 strikeouts, a 0.60 ERA and 0.60 WHIP. The other wins came from Yovani Gallardo and Derek Lowe with saves from Joe Nathan (2), Francisco Rodriguez and Kevin Gregg. In another close one, James defeated Ben on the first tiebreaker, ERA, to advance to the final. James team had an ERA of 3.44 vs. Ben's 4.69. Ben's team led 4 out of 5 offensive categories and James' led 4 out of 5 pitching categories. Garrett Atkins (5 R, 2 HR, 4 RBI, .429 AVG) and Brandon Phillips (6 R, 1 HR, 5 RBI, 2 SB, .364 AVG) had great weeks for James. Alfonso Soriano had 3 home runs while Chipper Jones hit .538. Adam Dunn was Ben's leader, hitting .421 with 7 runs, 3 home runs and 8 runs batted in. Chone Figgins also had a great week, hitting .400 with 5 runs, 4 runs driven in and 5 stolen bases. Like Kazmir for me and Carmona for Mike, James found a friend in Jake Peavy this week. He had 2 wins, 15 strikeouts, a 1.88 ERA and 0.84 WHIP. Ted Lilly (11 Ks), Joe Blanton and Kelvim Escobar also were credited with wins. Billy Wagner (2) and Bobby Jenks had the saves. Ben's lone win came from Brett Myers who also pitched in 2 saves. Ryan Dempster had 3 saves of his own, while Chad Cordero had 2. C.C. Sabathia had 13 strikeouts. Week 5: Patrick wins, 6-3-1. Week 14: Patrick wins, 6-4. James' strengths: saves (3rd), ERA (1st) and WHIP (3rd). Patrick's strengths: runs (1st), home runs (1st), RBIs (1st) and strikeouts (3rd). Patrick's weaknesses: stolen bases (10th), ERA (T8th) and WHIP (10th). The winner of this game will the champion of the league. Good luck. There are better fielders. There are faster runners. There are more powerful hitters. But there is only one Derek Jeter and it is moments like that that make him who he is. It's an honor to watch the best clutch hitter in history do his thing, and the best closer in history do his thing. Jeter is one of the reasons that I got up off the couch and came back. Man, I’m happy we have Derek Jeter. I think I'm naming my first child Derek after that one. Let's take a look, now that Joba has finally allowed an earned run. Joba: 13 G, 2-0, 0 S, 0 BS, 18 IP, 10 H, 2 R, 1 ER, 1 HR, 5 BB, 23 K, 0.50 ERA, 0.83 WHIP, .159 BAA. Gagne: 14 G, 1-1, 0 S, 2 BS, 13 IP, 21 H, 11 R, 11 ER, 1 HR, 4 BB, 15 K, 7.62 ERA, 1.92 WHIP, .356 BAA. You want poise? How about earning a mound visit from the pitching coach, only to be the one giving the reassuring pat? "When I see Joba pat Gator [Guidry] on the shoulder," said Torre, "I say, 'Well, I guess he's all right.'" "Yeah, he's pretty special," he said. The game started out with two seasoned warriors living up to their reputations. Clemens vs. Schilling was all it was supposed to be. Clemens pitched six strong innings allowing only one unearned run and two hits. It was his first start in about two weeks after his recent elbow problems. Schilling was just as masterful until the eighth. He had allowed only one run until then, on a home run from Cano in the fifth to tie the score. Doug Mientkiewicz got a single but Melky Cabrera was retired. Torre pulled a rabbit out of his hat and pinch hit for Jose Molina with Posada already in the game as DH. The trick worked as Giambi smashed a double high off he green monster to put runners on second and third with only one out. On the first pitch to Damon, Schilling jammed him and Pedroia fielded the ball and held the baserunners before throwing to first for the second out. Derek Jeter battled Schilling and eventually won the battle by launching a three run homer well over the green monster to give the Yankees the lead at 4-1. They would need all the runs. Joba Chamberlain followed Clemens and was greeted with a double by Eric Hinske. The big right hander toughened and, after Hinske was sacrificed to second, he got Lugo to strike out and retired Ellsbury on a grounder to first to end the seventh inning. In the eighth, Joba got the first two outs by retiring Pedroia and Big Papi but Mike Lowell then hit a homer off Joba, the first earned run he has given in his Major League career. He then struck out J.D. Drew to end the inning. The Yankees couldn't add any extra insurance and Rivera was summoned for the bottom of the ninth. Jason Varitek worked a walk and then Rivera got Hinske and Crisp on ground balls to move Varitek to third with two outs. Julio Lugo doubled up the alley in left, scoring Varitek to make the score 4-3. Ellsbury was hit with the first pitch and Pedroia battled a walk to load the bases. With the drama at a fever pitch, Big Papi was up to bat and on a 2-2 pitch, Mo jammed him with a cutter and got him to pop up to Jeter in short center field to end the game. The Yankees remain with a 2 1/2 game lead in the Wild Card with the Tigers winning again earlier in the day. The Yankees now return home for three with Baltimore and then four with Toronto. Not because I want the Yankees to win or anything like that, but for my fantasy teams! In the Yankees Bloggers League, I've got Posada, A-Rod, Jeter and Matsui. In the YanksBlog.com League, I've got Posada, Cano, A-Rod and Jeter. The only one that's done great in the past week is Posada. A-Rod (4 R, 1 HR, 3 RBI, 2 SB, .261 AVG) and Cano (3 R, 1 HR, 4 RBI, .250 AVG) have been alright, but I could really use the offensive boost today. Tyler Kepner has a great entry of bullet points related to the Yanks/Sox series. The Yankees won’t punish Melky Cabrera for continuing to slide into first, and Manager Joe Torre said he resisted the temptation to tell Melky’s mom about it when he saw her in the elevator this morning. “He’s been told a million times,” coach Larry Bowa said, with a sigh. Derek Jeter had a stack of four Yankees uniforms to sign for Red Sox players. The top one was from Mike Lowell. This is a common practice for players on opposing teams; when the Yanks played in Detroit last month, Phil Hughes had Magglio Ordonez sign a jersey, and Kyle Farnsworth had Barry Bonds to sign one in San Francisco in June. It isn’t free, either. A player must pay the team about $140 to buy the jersey he wants to have signed. Jeter, by the way, said he had never asked a fellow player for an autograph. “Maybe I’ll regret that someday,” he said. Finally, Dave and Aziz link to this Daily News article where the writer catches up with Bernie and we hear a bit about how he feels being out of the game at this time of the year. Often Williams will turn on Yankee games and see Joe Torre in the dugout, see his friends hugging and carrying on, and suddenly the longing to be there with them is so intense he can barely stand it. Williams grabs his own shirt, as if he were yanking himself out of the recording studio, into the clubhouse. "I watch the games until I get that feeling again, and then I have to go look at something else," Williams says. "I'll come back later and get the score." Posada, meanwhile, stayed in the game but was taken to Massachusetts General Hospital for precautionary tests afterward. CT scans on his head and neck were negative. "He'll be all right," Derek Jeter said. "He's got a hard head." Peter Abraham says that Wang will pitch before Kennedy. So, it'll be something like that. Does that mean that Clemens goes next Sunday? Probably depends on what happens today and how he feels. I'd be a little surprised if he is able get us 6 innings today, but if he can, then we could see an inning of Farnsworth, an inning of Joba and an inning of Mo. Yeah, that pretty much covers it. Yucky badness. After 4 and 1/2 innings, the game was a pitchers duel, with Wang and Beckett both holding the respective offenses to 1 run, both of which were scored in the 1st. Jeter hit a deep solo shot to center in his first at bat and Mike Lowell singled in Dustin Pedroia to tie it up. Then, we had the zeros. The Red Sox got to Wang again in the bottom of the 5th, as J.D. Drew singled with 2 outs to score Jacoby Ellsbury. Ellsbury had got into the game because Wang hit Youkilis with a pitch. Looking at the replay, it just looks like a high pitch that tailed in that Youkilis falls into because of his swing and the way he stands. At any rate, that didn't stop Beckett from plunking Giambi, our first baseman, the next time he came to the plate. Whatever. Wang just couldn't get out of the 6th. After allowing a lead off double and then a single that pushed the runner to 3rd, he got Julio Lugo to fly out. Pedroia hit a ground ball to Cano which Cano picked cleanly, making a great throw to the plate. Jorge caught it and had just a split second to turn and tag Eric Hinske, who barreled into him, forearm up into Posada's neck, knocking his mask off, at full speed. It was a terrific, terrific play by Posada and you can watch it here. Looking at that replay, it appears that Posada was signaling to Cano to take the out at 1st. With that second out, it looked like we might get out of the inning. Unfortunately, that was not the case. Jacoby Ellsbury signed in Crisp and Ortiz doubled in Pedroia and Ellsbury to make it 5-1. By the end of the inning, Wang had been relieved by Edwar, who struck out Lowell for the final out. In the 7th, Ramirez walked Drew and struck out Varitek and was then relieved by Ron Villone. Villone walked Hinske and was taken out of the game in favor of Bruney. The first batter he faced, Coco Crisp, hit a ground rule, RBI double. Bruney walked Lugo and struck out Pedroia before being pulled for Sean Henn. Henn allowed a 2 RBI single to Ellsbury and then walked David Ortiz. This brought in Ross Ohlendorf for his second major league appearance. He walked Mike Lowell with the bases loaded, allowing the 9th Red Sox run to cross the plate. Finally, J.D. Drew was struck out and the half inning was over. All told, it took more than 30 minutes for the Red Sox to score those 4 runs, thanks to 4 walks and 4 pitching changes. Ohlendorf would come out and pitch the 8th in garbage time, allowing a solo shot to Eric Hinske. The Yankees offense looked terrible, making it that much easier for Beckett to win the Cy this year. We had 4 hits and 3 walks. 2 of those hits came from Jeter. 1 came from Abreu and the other was provided by Cano. With the loss, the Yankees will fall back to 5.5 games back in the division, giving the Red Sox a magic number of 9 with 27 combined Yankees and Red Sox games left in the season (with 2 of those being tomorrow in 1 game, of course). It'll be Clemens vs. Schilling tomorrow in the rubber game. The story of the game until the eighth inning was one of missed opportunities and sloppy defense for the Yankees. They trailed 7-2 and were looking at Okajima and Papelbon in the bullpen if they got any closer. Okajima started the eighth and gave up home runs to Jason Giambi and Robinson Cano to make the score 7-4. He walked Melky Cabrera and Johnny Damon followed with a double up the gap in left to put runners on second and third with no outs. Papelbon relieved and Derek Jeter fought off an inside fastball and looped it to right to score Cabrera and put the tying runs on base. Bobby Abreu followed with a booming double off the wall in center field, just missing a homer and both runners scored to tie the game. A-Rod followed with a line single to left center to put the Yankees ahead 8-7. The Yankees had an opportunity in the first inning with the bases loaded vs. Dice-K and only one out but could not score. The Red Sox got a run early and added another on an error from Giambi. In the fourth, the Yankees struck back for one but left runners on base again. Andy Pettitte simply was not sharp all night and left after four with a high pitch count. He would surrender three more runs and left with his team behind 5-1. The Yankees closed to 5-2 but couldn't get any closer. Jose Veras pitched well but had an opportunity to get out of an inning with no runs, but Jason Giambi dropped a throw from Abreu in right which would have doubled off Ortiz to end the inning. J.D. Drew followed with a hit and another run. The Red Sox would add another to make it seem safe until the Yankees erupted in the eighth. The Yankees could not add any insurnace and Vizcaino pitched a scoreless eighth and Rivera saved the game in the ninth only surrendering a single to Drew. The series resumes tomorrow afternoon with potential Cy Young candidates Josh Beckett and Chien-Ming Wang the probable starters. This is not amusing. So far, this month, you have three good hitters - Abreu, A-Rod and Posada. Everyone else...if you have children, don't let them see this. 25 XBHs for the top three guys versus 14 total for the 7 guys listed there. This isn't going to get it done for the rest of the month, let alone in the playoffs. Let's hope most of these guys turn it around because we've gone through extended hitting slumps (see 2007, April-May) and no one was amused. Well, that was annoying (thought it makes for a very easy wrap-up). First the good points. Ian Kennedy was great. He started the game off shakily by giving up a two-out RBI double to the Big Hurt (but who hasn't? He's got 486 2-baggers in his career for a reason) but then settled down and proceeded to shut down the Blue Jays line-up (admittedly one of the weakest in the AL especially when Glaus isn't in there). Still, whenever a young pitcher one-hits any team over 7 innings, it's an impressive thing. As sharp as Kennedy was, A.J. Burnett was just as dominating, giving up four hits over eight innings (walking 2 and and striking out 8). Burnett made one mistake in the sixth and Johnny Damon (!) made him pay, taking him him deep to right and tying the ball game at 1. Still Burnett went 8 strong (on 120 pitches) though he might have been taken out an inning earlier had not the Yankees gone down in order (Cano-Cabrera-Betimit) on 7 pitches in the 7th. Kennedy started the eighth but was pulled after walking the lead-off batter for Luis Vizcaino. Viz, who made his first appearance since being shelved for arm discomfort, gave up a sac bunt but then proceeded to strike out Reed Johnson and Russ Adams. The Yankees put men on in the top of the ninth but as they did all game, they couldn't come through with the clutch two-out hit. Abreu singled to start it off but A-Rod K'd and after a Matsui infield single to put runners at first and second with one out, both Cano and Cabrera grounded out to end the inning. Chris Britton came on for the bottom of the ninth to face the only good hitters in the Jays line-up. Britton, who hadn't pitched since the 8th (not making excuses, just stating a fact) gave up a single to Alex Rios, who promptly stole second and then gave up the game-winning single to Frank Thomas. Why Thomas wasn't intentionally walked when first base was open is a good question though. I'll take my chances with anyone else on that roster and when the Big Hurt is running, there's always a shot to turn two. Finally, as an aside, I get that "theee Yankees win" is John Sterling's bit but does he really need to get so excited about the other team winning too? If you heard him last night, it was as if the Jays had just won the division or something. John, calm down before you hurt yourself. The link between the Yankees' Shelley Duncan and his brother, Cardinals outfielder Chris Duncan, took a bizarre twist this week. Both players were diagnosed with hernias that figure to put their playing time in jeopardy. Shelley Duncan, a 27-year-old who made an immediate impact with an initial power barrage, had an MRI exam administered on Wednesday at the Columbia Presbyterian Medical Center in New York, where Yankees team physician Dr. Stuart Hershon and Dr. George Todd diagnosed the rookie as having a bone bruise on his left pelvis and a small inguinal hernia. Yankees manager Joe Torre said he was told that the hernia will not immediately require surgery, if at all, and Duncan was expected to fly back to Toronto on Wednesday. I'll be on MaristRadio.net out of Poughkeepsie, NY tomorrow (Thursday) night. It's the AM radio station (though it's not available on AM at the moment - it would usually be 1630 AM) for Marist College. I'll be on the "Sports Nation" program, hosted by Ryan Schneider and Dustin Aglietti, which runs from 9:00 PM - 11:00 PM ET. I'm supposed to be coming on at around 9:40 PM. I should only be on for 10 minutes or so. You can webcast the show from the station's website (listen here). We'll be discussing the upcoming Red Sox series. If you can listen in, please do. Thanks to them for having me. Phil Allard has a great interview with Brian Cashman where he touches on a number of subjects, including our young pitchers, the Joba Rules, Kei Igawa, A-Rod's contract and more. The rapid ascent of Joba Chamberlain has to be a surprise to you and everyone in Baseball. When you have a great deal of ability and it comes together, you can move fast. No one would have thought he’d be doing this in ’07 – same as Ian Kennedy -- but sometimes players move themselves ahead of their developmental program. In these two cases they have. Joba Chamberlain has been a huge stabilizing impact on our bullpen. The Joba rules have also contributed to the fact that – since there are days he can’t be used – it forces a situation where others have to be used, because there are no other choices, to be quite honest. This has helped Kyle Farnsworth, whose 10 of his last 11 appearances have been shut out baseball, and Edwar Ramirez has done very well. Now the work load is spread evenly throughout the bullpen. That might not be the case if Joba were available more often. And this is to protect Joba in a role he isn’t accustomed to. I know that some people in the media have been saying that this is my way of protecting Joba from the manager. Nothing is further from the truth. This is about protecting a young pitcher at the end of his inning limit who has never been a reliever before. And we relied on Nardi Contreras to develop a program that would protect him. When I realized that we weren’t going to secure any outside help -- I didn’t want to give up the farm system -- we started to prepare him for the bullpen and his graduation to the big leagues and he has been spectacular. Shelley Duncan has what the team is calling "discomfort in his lower abdominal wall" and was sent back to New York to be examined by team physician Stuart Hershon. He will have an MRI today. Torre said Duncan has been dealing with the injury for about a month. If Duncan has a hernia, he could be out for the remainder of the season. In an ironic twist, Duncan's younger brother Chris left the Cardinals on Monday because of a hernia and is expected to miss at least 10 days. On a related note, Jesse Spector has a great interview with Mr. Duncan. Clemens said an MRI exam revealed ligament damage and internal bleeding in his forearm, adding that the muscle was "pretty nasty." The elbow problem might have stemmed from a blister on Clemens' foot that caused him to alter his mechanics. He expects to pitch in the finale of the upcoming Red Sox series. Tonight, Phil Hughes made the 10th start of his major league career. It was a good one. He went 6 innings, allowing just 3 hits and 1 ER with 3 walks and a strikeout. He got the win, improving to 3-3. It was an all rookie affair, as Edwar came in and threw two scoreless innings and Ross Ohlendorf made the first appearance of his career, throwing a 1-2-3 9th. Congrats to Ross. 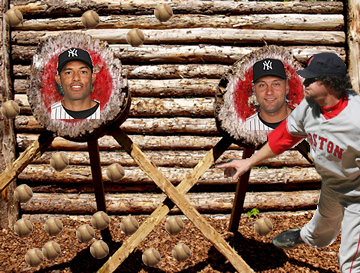 The Yankees pounded Shaun Marcum for 8 earned runs in 4 and 1/3 innings. Jeter started at short shop, going 0 for 3 with 2 walks. Giambi was 1 for 3 with a grand slam, 2 runs and a walk. Posada was 2 for 3 with a double, a homer and 3 runs. Damon was 3 for 5 with 1 run and 2 RBI. Abreu was 2 for 5 with 2 doubles and a run. A-Rod was *just* 2 for 4 with no homers and 1 run. Matsui was 0 for 4 and managed to get an RBI on a sac fly, Cano was 1 for 4 with 1 run and Melky was 0 for 5. The Tigers played a double header, losing the first game and winning the second, so we gained a half game there. In the Red Sox and Devil Rays game, the Rays were leading 8-1 after 4 and 1/2 innings. Unfortunately, that was not a safe lead as they allowed 4, 3, 6 and 2 runs, respectively, in each of the next 4 Red Sox halves of the inning. Tomorrow, we'll send Moose (8-10, 5.51 ERA) up against Dustin McGowan (10-8, 3.90). A-Rod was named the AL Player of the Week and Pettitte was named the MLB Clutch Performer of the Month. In all, the American League Player of the Week hit .565 with seven homers, 11 RBIs and nine runs scored while putting up an astounding 1.478 slugging percentage. However, helped by Pettitte's consistent starts and the Majors' best second-half offense, the team went 18-11 in the month, including a 6-0 mark when Pettitte pitched. Today the Yankees were off, so we could only watch while the Red Sox and Tigers either gained or lost a half game. Well, it was a split. Scott Kazmir held the Sox to zero runs in 7 innings to notch a 1-0 win, but the Tigers by scoring 4 runs in the 9th to win by 1. That makes us 5 games back in the division and puts our Wild Card lead at 3.5 games. The first round of playoffs in the Yankees Bloggers Fantasy Baseball League has come to a close. Aziz led the batting categories, taking runs, home runs and runs batted in. Ryan Braun was a big part of this, hitting .304 while scoring 8 runs, hitting 4 homers and driving in 8. Magglio Ordonez hit .400 for the week, to go along with 3 runs and 3 runs batted in. Curtis Granderson (7 R, 2 HR, 2 RBI, 3 SB, .370 AVG) and Albert Pujols (3 R, 5 RBI, .400 AVG) were Ben's biggest contributors. Ben's pitching performed better, though, winning saves, ERA and WHIP. Wins ended in a tie at 3, despite Aziz using 10 starting pitchers. Ben had wins from C.C. Sabathia (2) (9 Ks) and Brad Hennessey and saves from Chad Cordero (3), Hennessey (2) and Brett Myers (2). Aziz's wins came from Ben Sheets (11 Ks), Oliver Perez and Dustin McGowan (12 Ks). Matt Cain also had 9 strikeouts. Francisco Cordero (2), Takashi Saito and C.J. Wilson had saves. My offense had a terrific week, hitting .330 with 37 runs, 15 home runs, 42 runs batted in and 2 stolen bases. This resulted in me winning all of those categories, except for stolen bases. A-Rod had a monster week, hitting .565 with 9 runs, 7 home runs, 11 runs batted in and 1 stolen base. Jorge Posada (7 R, 3 HR, 6 RBI, .500 AVG) and Prince Fielder (6 R, 3 HR, 5 RBI, .381 AVG) also had great weeks. Freddy Sanchez drove in 8 runs. Aaron Rowand hit .417. For Dave, the biggest guy was Hanley Ramirez (3 R, 2 HR, 3 RBI, 3 SB, .240 AVG). Live Aziz, Dave threw a lot of starting pitchers out there, in an attempt to capture strikeouts and wins. He accomplished both, utilizing 13 starters to do so. But, I took the other 3 categories with 5 saves, a 2.40 ERA and 1.02 WHIP. I had wins from Manny Corpas and Justin Verlander and saves from Mo (2), Corpas (2) and Joe Borowski. Pedro Martinez, Al Reyes, Carlos Zambrano, Tom Glavine, Mike Pelfrey and David Wells had wins for Aziz while Joaquin Benoit (2) and Al Reyes had saves. Week 3: Patrick wins, 5-4-1. Week 21: Patrick wins, 6-4. Mike's strengths: runs (3rd in the league), stolen bases (1st), wins (T1st), strikeouts (1st) and ERA (2nd). Mike's weaknesses: RBIs (8th) and batting average (8th). Week 6: James wins, 8-2. Week 15: James wins, 7-2-1. Ben's strengths: home runs (2nd) and batting average (3rd). Ben's weaknesses: stolen bases (8th). The winners of these two games will face each other. Good luck everyone. Peter Abraham reports that after the finish of Scanton's season, the Yankees have decided to call up Matt DeSalvo, Kei Igawa, Sean Henn, Jeff Karstens, Ross Ohlendorf and Bronson Sardinha. With Ohlendorf not on the 40 man roster, someone will need to be dropped to make room for him. No word on who that will be, yet. Once Trenton ends their season, the Yanks plan to bring Tyler Clippard and Chase Wright up, as well. That would give them 37 players. "It is just something that he has been dealing with, and I think he is at the point now where is having trouble dealing with it," Torre said, "even though if you put his name in the lineup, that is where he will go. But hopefully, the couple days off will help him feel better. Moose will start Wednesday in Toronto against the Blue Jays. Wang pitches today in place of Clemens. Tomorrow is an off day. Then, we'll have Hughes and then Mussina. Scott Boras is gonna sleep like a baby tonight, that's for sure. His boy, Alex, hit his 50th and 51st home runs for the Yankees. This marks the first time that a Yankee has hit 50 home runs since 1961 (and yes, Justin, the first right handed Yankee of all-time). Awesome. Congrats to Alex, who finished the night 2 for 3 with 3 RBI and a walk. The rest of the offense wasn't bad, either. Damon was 3 for 6 with 1 2B, 1 HR, 2 R and 2 RBI. Abreu was 2 for 4 with 2 2B, 1 R and 2 RBI. Cano was 2 for 4 with 1 SB. Betemit was 2 for 4 with 1 HR, 2 R, 3 RBI and 1 BB. Melky was 2 for 4 with 1 R and 1 BB. The only Yankees to go without a hit were Jeter (0 for 3), Matsui (0 for 4) and Posada (0 for 3), but both Matsui and Posada (1 BB) scored a run. Jeter was taken out in the 5th with a stiff right knee and was replaced by Alberto Gonzalez, who scored and drove in the first runs of his career by reaching on a fielder's choice. Congrats to Alberto, as well. Pettitte had a solid outing, throwing 6 and 1/3 innings, allowing 2 ER. The bullpen wasn't so great - Britton allowed 1 ER in 1 and 2/3 IP, Bruney allowed 2 ER in 1/3 IP and Edwar allowed 0 ER in 2/3 IP. The Red Sox lost, putting us at 5.5 games back. The Tigers won, so they remain 3 games back in the Wild Card (the Mariners are now 5 games back). We play the Royals again tomorrow at 2:10 PM ET. Gagne hasn't pitched since August 26, so Joba has caught him in games pitched since the trade deadline. Joba: 11 G, 1-0, 0 S, 0 BS, 14.1 IP, 7 H, 0 R, 0 ER, 0 HR, 4 BB, 18 K, 0.00 ERA, 0.77 WHIP, .143 BAA. “How did my boy do for you, Joe?” the proud father asked as he shook the manager’s hand. A team leader on the field and in the clubhouse, Derek has been at the forefront of myriad charitable efforts as well. His Turn 2 Foundation, which the Yankees' captain established 10 years ago, has raised more than $7 million to help children across the country. The organization is considered a model among sports charities. Turn 2 creates and finances programs that promote the development of sound academic, fitness and leadership habits among children and to caution against the dangers of drugs and alcohol. 09/08: Give Us Your Cash! Kevin Thompson was traded to the Athletics for cash considerations. Ian Kennedy struggled through five innings, but only gave up two runs and left with the game tied at two. Farnsworth, Chamberlain and Rivera pitched four scoreless innings and the Yankees added a run in the seventh to pull out a 3-2 victory. Kennedy escaped a bases loaded jam in the first and had runners on in almost every inning. In the second, he gave up two runs to tie the score. The Yankees had jumped out to a 2-0 lead on homers from A-Rod and Posada, but the Royals were able to tie it early and it remained so until the seventh. Kansas City starter Gil Meche got out of a bases loaded jam of his own in the sixth when he was able to strike out Robinson Cano looking to end the inning. In the seventh, Jeter got a two out single and Abreu followed with a double off the wall in left center with Jeter scoring. Farnsworth pitched a solid sixth with two strikeouts and Joba Chamberlain pitched the 7th and the 8th without giving up a run. Chamberlain had his father and about 120 of his family and friends in attendance from Lincoln, Nebraska to support him. He was obviously pumped up and was overthrowing but got through the two innings unharmed. Rivera was awesome in the ninth, retiring the side on seven pitches including a game ending strikeout of Mark Grudzielanek to preserve a 3-2 Yankee victory. The series resumes tonight with Andy Pettitte squaring off against rookie Brian Bannister. We won coin flips with both the Tigers and the Mariners, making it so that if we need to do a wild card tiebreaker with either team, we'll be at home. I thought that I would mention that I'll be on Sports Talk Live with Frankie the Sports Guy tomorrow, Saturday, September 8. The show is broadcast live online from 9:00 PM to 10:00 PM ET on BlogTalkRadio (listen here) and it will be rebroadcast from 6:00 PM ET to 7:00 PM ET on MVN Radio. Mark Kelly has the largest deficits, in September, that have been overcome to win a division title. We're 6.5 back on September 6. The only one that matches up with that is the 1995 Mariners (yes, THOSE Mariners), who were 6.5 games back on September 8. Of course, then we're talking crazy numbers (they went 16-3 in their last 19 games while the Angels went 8-11). What's happened since we swept Boston (losing 1.5 games) has most likely sealed the deal. That said, we both have 6 games before we meet again. If we can gain two games in that stretch (and, as such, gain the 1.5 back), we'll have a shot. We'll need to sweep them in Fenway, of course. It's not much, but it's out there. "I didn't get one of the invitations," Torre joked. "We just hope his prospective wife is very understanding." According to Mark Herrmann, CMW will start Sunday against the Royals, in place of the Rocket. He'll be pitching on his normal 4 days rest. If the schedule stays in line, it seems that after his start on the 9th against the Royals, he'll pitch the 14th against the Red Sox, the 19th against the Orioles, the 24th against the Blue Jays and the 29th against the Orioles. So, that would mean 5 more starts. If he can get 3 wins, he'll be our first 20 game winner since 2003, when Pettitte went 21-8. According to Peter Abraham, Jorge is up for the Roberto Clemente Award. You can vote here. Voting ends October 5. Mark Herrmann reports that Luis Vizcaino's should is bugging him, so he'll be getting a couple days of rest. He had an MRI and the results were fine, according to Cashman. John Sickels over at MinorLeagueBlog has a quick post detailing his thoughts on Ian Kennedy. It's an interesting read and the comments section over there is usually pretty insightful. Late in last night's game, A-Rod made a head first slide into 3rd and Adrian Beltre (listed at 220 pounds) tripped on him and landed on his right leg. If you watch the video, you can see it was pretty scary. And, if that wasn't bad enough, in the top half of the inning, Wang came out with back stiffness. A-Rod had X-rays and they were, thankfully, negative. But, he's sore. Meanwhile, Wang felt better after the game after getting some ice treatment. Clemens will miss his start on Sunday at Kansas City, with Mike Mussina replacing him. Clemens could return for the Red Sox series at Fenway Park, Sept. 14-16. "We're thinking one start. We'll see," manager Joe Torre said. "He'll have to go out and throw on the mound before he can pitch. ... His elbow seems stable. There doesn't seem to be any damage that concerns anybody." I suppose, if there is any good in this, it's good that it's against a .449 team like the Royals as opposed to a better team. As luck would have it, Moose is 2-0 with a 2.31 ERA in 2 starts against the Royals this year. They are 1 of 2 teams he has 2 wins against and 1 of 5 teams that he has an ERA of 3.00 or lower against (with 3 of those, he only pitched once). "Both bats were in full compliance with Major League Baseball's bat regulations, and neither bat showed any signs of tampering and/or alteration," the commissioner's office said in a statement. "The bats will be returned to Iwamura and Rodriguez promptly." Through 5 and 1/2 innings, this was a pitchers duel. The Yankees were up 1-0, thanks to a Jorge Posada home run in the 2nd inning. But, after a lead off out from Bobby Abreu, the Yankees put up 3 runs. The first came with an A-Rod homer, then a Cano RBI single to score Posada, followed by a Betemit RBI single to score Matsui. The Mariners finally got on the board with a solo homer from Adrian Beltre in the top of the 7th. But, the Yankees blew it wide open after that, scoring 7 in the 7th. The Yankees sent 12 men to the plate in the inning and had 8 hits. Abreu, Duncan, Cano, Melky and Jeter all had run scoring hits. The Mariners had a 2 RBI double in the 8th and Posada tacked one more on with a homer in the bottom half. and that's where it would end. Yankees win, 12-3. Back to a 2 game lead in the wild card. Every Yankees starter picked up a hit, besides Matsui, who walked and scored a run. Posada was the star tonight, going 4 for 4 with 2 HR, 4 R and 2 RBI. Besides him, Melky was 1 for 5 with 1 R and 1 RBI, Jeter was 1 for 5 with 1 RBI, Abreu was 4 for 5 with 1 B, 1 HR, 1 R and 1 RBI, A-Rod was 2 for 4 with 1 HR, 2 R and 1 RBI, Duncan was 1 for 5 with 1 R and 2 RBI, Cano was 4 for 5 with 1 R and 3 RBI and Betemit was 2 for 2 with 1 RBI. Was there ever any doubt that Wang was the ace of this staff? Man, the guy's stepped up huge these last 3 starts against 3 very good teams - the Tigers, Red Sox and Mariners and this is his line. 22.1 IP, 11 H, 3 R, 2 ER, 9 BB, 12 K. 22.1 IP, 11 H and 2 ER. Bang. After Wang retired the 1st hitter in the 8th, Torre went to Vizcaino, who probably needed some work as he hasn't pitched since allowing 3 ER on the 1st. He struck out the first batter he faced and then walked a guy and allowed a single, then a double to score both of those other guys. Britton came in and got the final out of the 8th. And then, after allowing a lead off single, retired the next 3 batters in the 9th to end the game. The Red Sox beat the Blue Jays, 5-3. So, no ground gained there. We could really use a continued offensive explosion tomorrow as we'll have Phil Hughes (2-3, 5.65) against Jarrod Washburn (9-12, 4.37) at 7:05 ET. Jack Curry at the Times has a nice story about Alex Rodriguez and his half brother that he didn't see for 23 years (ending in 2003 when he attended a Rangers game). Good break from baseball stuff, I'd say. Andy Phillips' troubled season has been dealt another bad break. The Yankees first baseman suffered a fractured pisiform bone in his right wrist and will have season-ending surgery on Tuesday. The 29-year-old Phillips was hit by a Jason Hammel fastball in the fifth inning of the Yankees' 8-2 loss to the Devil Rays on Sunday. Phillips remained in the game to run the bases but did not come out for the next inning in the field. The Yankees' tag team of veteran starters struggled yesterday in a 7-1 loss that sliced the Bombers' lead over the Mariners to one game in the wild card race. Boston defeated Toronto as well, extending their lead over the Yankees in the East to 7 games. Roger Clemens struggled, allowing 5 runs on 8 hits before leaving the game after the 4th inning due to pain in his elbow. Clemens is now scheduled to have an MRI and Joe Torre said he might skip his next start just in case. Mike Mussina, who would probably start in his place, pitched 3 and 2/3 innings in relief and struggled as well, giving up 2 runs on 7 hits. Aside from an RBI single in the 1st inning by Alex Rodriguez (now 130 RBI on Sept. 4), there wasn't really much offense generated by the Yankees, either. Rodriguez and Posada had two hits each, but they put up goose eggs in the last eight innings of the game. Funny thing, 10 years ago you'd think that you'd only see Roger Clemens and Mike Mussina pitching in the same game for the same team if it was your team in some video game, and those were the things that made some people look at the games and say "Boy, these games are really rediculous." The Yanks will try to bounce back tonight as they send Chien-Ming Wang to the mound to face Horacio Ramirez. Game starts at 7:05 ET. 3. Sports!!! vs. 6. The Holy Muffins. 4. terpballaz vs. 5. The American Idiots. Andy Pettitte lost to Tampa Bay for only the second time in 20 career starts as he surrendered 11 hits and five runs. He was able to work his way out of several jams until he surrendered a homer to Carlos Pena to make the score 5-1. The Yankees would add a run to make it 5-2 but then Edwar Ramirez gave it right back and then some by giving up gopher balls to Josh Wilson and Akinori Iwamura. The Bombers looked kind of flat all weekend after sweeping the Red Sox. The good news is that the Seattle Mariners have lost nine straight and the Yankees still maintain a two game lead over them. The season gets even more interesting starting Monday afternoon when the Mariners visit the Bronx for a Labor Day afternoon tilt. Young phenom Felix Hernandez is on the hill vs. Roger Clemens in the first of a three game series. A-Rod currently sits at 45 home runs. The Yankees have played 137 games and he has played 135. He's on pace to hit 53 home runs. Only 3 Yankees have ever hit 50 home runs or more. They are Roger Maris (61 in 1961), Babe Ruth (60 in 1927, 59 in 1921 and 54 in 1920 and 1928) and Mickey Mantle (54 in 1961 and 52 in 1956). Not too shabby. If he hits 50, he'll do something for us that no one has done in 46 years. It's playoff time in the Yankees Bloggers Fantasy Baseball League. The top 6 teams in the league made the playoffs and those teams are Mike (River Ave. Blues), James, Ben (River Ave. Blues), Dave (Pride of the Yankees), me and Aziz (Pride of the Yankees). So, we've got two teams from River Ave. Blues, two teams from YanksBlog.com and two teams from (Pride of the Yankees). And no two guys from the same blog will have to face each other until, possibly, the championship game as the top and bottom brackets each feature one person from each of the three sites. It's funny how that worked out. Congrats again to everyone who made it. Mike and James took the top 2 spots in the league, so they both receive first round byes and will not be playing this week. Let's take a look at this week's match ups. Week 8: Ben wins, 7-3. Week 17: Aziz wins, 5-4-1. Ben's strengths: home runs (2nd in the league) and batting average (3rd). Aziz's strengths: runs (3rd), home runs (3rd), RBIs (2nd), batting average (1st), saves (1st) and ERA (3rd). Aziz's weaknesses: wins (9th) and strikeouts (8th). Finally, I just wanted to highlight the comeback that Aziz had to make, just to sneak in as the last save by 1.5 games. He won his final 4 matches, 3 of which were against playoff teams, beating Mike (5-2-3), Dave (7-3), James (7-2-1) and EJ Pinstripe Potentials and Pending Pinstripes) (10-0). Huge comeback there. The winner of this game will face James. Week 4: Dave wins, 9-1. Week 13: Dave wins, 8-2. Week 22: Patrick wins, 7-2-1. Dave's strengths: batting average (2nd) (the brothers Nekoukar have batting average locked down). Dave's weaknesses: runs (8th), wins (8th) and strikeouts (9th). The winner of this game will face Mike. James crushed Seamus, 9-1. In every category he won, James won big, winning runs by 11, home runs by 8, RBIs by 19, batting average by .038, wins by 5, saves by 3, strikeouts by 48, ERA by 4.59 and WHIP by .40. Seamus managed to take stolen bases by 4, though. James' offense was led by Lance Berkman (4 R, 3 HR, 6 RBI, 1 SB, .391 AVG) and Miguel Tejada (5 R, 3 HR, 4 RBI, .391 AVG). Garrett Atkins (3 R, 2 HR, 8 RBI, .318 AVG) and Pat Burrell (5 R, 4 HR, 9 RBI, .192 AVG) also made some big contributions. Carlos Delgado led Seamus' side, thanks to a 5 R, 3 HR, 9 RBI, .346 AVG week. James had a pair of 2 win weeks, thanks to Chad Billingsley (15 Ks) and Jake Peavy (20 Ks). Adam Wainwright also had a win. His saves came from Bobby Jenks, Billy Wagner and Jose Valverde. Seamus had 1 win (Jered Weaver) and no saves. Brandon Webb struck out 11. With a playoff spot on the line, I beat Dave (Pride of the Yankees), 7-2. In our two earlier meetings, he had had his way with me, winning 2 matches by a combined score of 17-3. But, I finally got one. We tied in the offense side with each of us taking 2 categories and then tying in RBIs. My offense was boosted by Freddy Sanchez (3 R, 1 HR, 8 RBI, .480 AVG), Dan Uggla (5 R, 3 HR, 4 RBI, .400 AVG) and Alex Rodriguez (3 R, 1 HR, 8 RBI, .480 AVG). Dave's biggest bats were Alex Rios (7 R, 2 HR, 4 RBI, 2 SB, .400 AVG) and Vladimir Guerrero (4 R, 1 HR, 6 RBI, .462 AVG). Pitching is where I went ahead, as I swept all 5 categories. My pitchers had a great week, picking up 8 wins, 7 saves and 62 strikeouts with a 3.89 ERA and 1.36 WHIP. I got 2 win weeks out of Brian Bannister and Huston Street (10 Ks) as well as wins from Andy Pettitte (13 Ks), Joe Borowski, Justin Verlander (10 Ks) and Scott Kazmir. Mariano had 3 saves, Borowski had 2 and Manny Corpas and Danys Baez had 1 each. Dave's only win came from Tom Glavine with saves coming from Al Reyes (2), Matt Capps (2), Jason Isringhausen and Joaquin Benoit. Clinched playoff spots (3 available): Mike, James, Ben, Dave, me and Aziz (Pride of the Yankees). With the rosters expanding, in additon to Kennedy, Doug Mientkiewicz, Alberto Gonzalez and Jose Veras have been added to the roster. Sir Ian Kennedy (I hear he has a wonderful middle name) made the first major league start of his career this afternoon and he did not disappoint, throwing 7 innings of 5 hit, 3 run and 1 earned run ball to go along with 2 walks and 6 strikeouts. I'm not sure how he only got 1 ER and not 3, but that's what the box scores are telling me, so let's go with it. The Yankees offense came out in support, putting up 7 runs in the first 4 innings. A-Rod got the team started in the first with a 2 run shot (number 45) that scored Abreu. A-Rod had a huge day, going 3 for 4 with that homer, plus a double and 4 RBIs. Devil Rays manager Joe Maddon tried to derail his day by taking his bat before his second at bat, but A-Rod had no part of that. In the 2nd inning, Joe Torre asked for Akinori Iwamura's bat to be examined (it has a flat end, apparently) and it was confiscated. So, the next inning, Maddon did the same. You can watch the video at MLB.com (click "A-Rod's bat confiscated"). Whatever. Both Abreu and Giambi grounded runs in in the 3rd to score the 3rd and 4th runs. They would add 3 more in the 3rd, thanks to Abreu walking with the bases loaded and A-Rod doubling home Jeter and Molina. The Devil Rays finally answered back via a B.J. Upton home run in the 6th. Kennedy came back out to pitch the 7th, retiring the side in order and finishing his day with a strikeout. He threw 99 pitches on the day - 66 for strikes. A pair of RBI singles in the bottom of the 7th made the score 9-3. Jose Molina singled to score Shelley Duncan and Melky singled to score Andy Phillips. Jose Vizcaino came out to pitch the 8th and it didn't go so well. He walked the lead off man and then allowed an RBI double with the runner advancing to third, thanks to an error by Melky. A sacrifice fly cleared the bases and made it 9-5 with 1 out. B.J. Upton doubled and Delmon Young singled to make it 1st and 3rd. A second sacrifice fly, this time off the bat of Brendan Harris, pushed Young to second and another run across the plate. With Greg Norton pinch hitting and a runner on second, Torre made the call to Mo. Not taking any chances today. Mo answered, getting a ground out from Norton to end the inning. Mo was flat out dominant in the 9th, striking out the side in order to end the game and collect save number 23. The Mariners lost to Toronto, 2-1, so we now hold a 2 game lead in the Wild Card standings. The Red Sox play tonight at 7:05 PM ET. Tomorrow, we have the series finale with Andy (12-7, 3.70) going against Jason Hammel (1-4, 7.44). Andy Sonnanstine was brilliant through eight innings allowing only one run on an RBI single to A-Rod and Phil Hughes looked ineffective for the third straight appearance as he was constantly behind hitters. Carlos Pena got two homers for the Devil Rays and Carl Crawford added a few hits as Tampa Bay romped to a 9-1 victory. Chris Britton also gave up a homer to Pena and was largely just in for mop up duty. The series resumes on Saturday afternoon with Ian Kennedy making his major league debut for the Yankees.